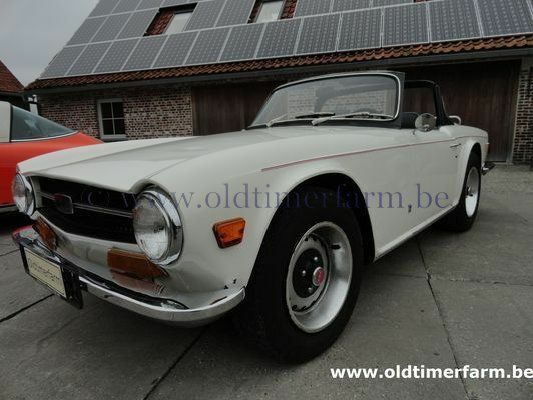 The Triumph TR6 (1969–76) was a British six-cylinder sports car and the best-seller of the TR range built by Triumph when production ended in July 1976. This record was then surpassed by the TR7. 94,619 TR6s were built, of which 86,249 found homes overseas, only 8,370 being sold in the UK. The bodywork closely resembled that of the previous model, but the front and back ends were squared off, reportedly based on a consultancy contract involving Karmann. All TR6 sports cars featured inline six-cylinder engines. For the US market the engine was carburetted, as had been the US-only TR250 model's engine. For other world markets, including the United Kingdom, the TR6 was fuel-injected, therefore TR6PI (petrol injection), as had been the non-US market TR5. 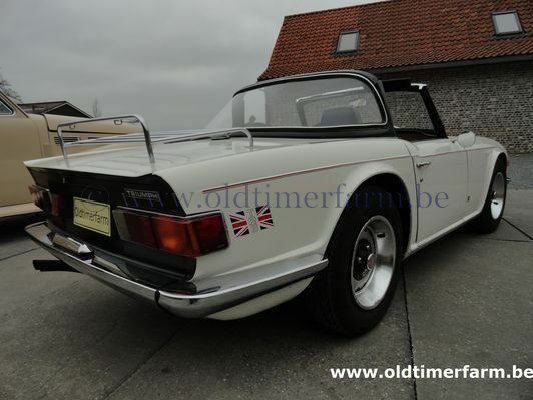 The Lucas mechanical fuel injection system helped the home-market TR6 produce 150 bhp (112 kW) at model introduction. Later the non-US TR6 variant was detuned to 125 hp (93 kW) in order for it to be easier to drive, while the US-variant continued to be carburetted with a mere (but more reliable) 104 hp (78 kW). The TR6 featured a four speed manual transmission. An optional equipment overdrive unit was a desirable feature because it gave drivers close-gearing for aggressive driving, yet "long legs" for open motorways. TR6 also featured independent rear suspension, rack and pinion steering, fifteen inch (381 mm) wheels and tires, pile carpet on floors and trunk/boot, bucket seats, and a full complement of instrumentation. Braking was accomplished by disc brakes in the front; drum brakes in the rear. A factory steel hard top was optional. TR6 construction was fundamentally old-fashioned: the body was bolted onto a frame instead of the two being integrated into a unibody structure; the TR6 dashboard was wooden (plywood w/ veneer). Specifications . Body : length/width/ height/ wheelbase –cm (in) : 404/147/127/224 (159/58/50/88.2); weight : 1120 kg (2472 lbs). Engine : 6-cylinders 2498 cc, front-mounted, 4-speed, manual, rear-wheel drive. Power : 105 bhp - 5000 rpm; torque : 222 Nm at 3500 rpm. Top speed : 192 km/h (119 mph). Oldtimerfarm Team wishes you happy Easter. We are closed Easter Monday.